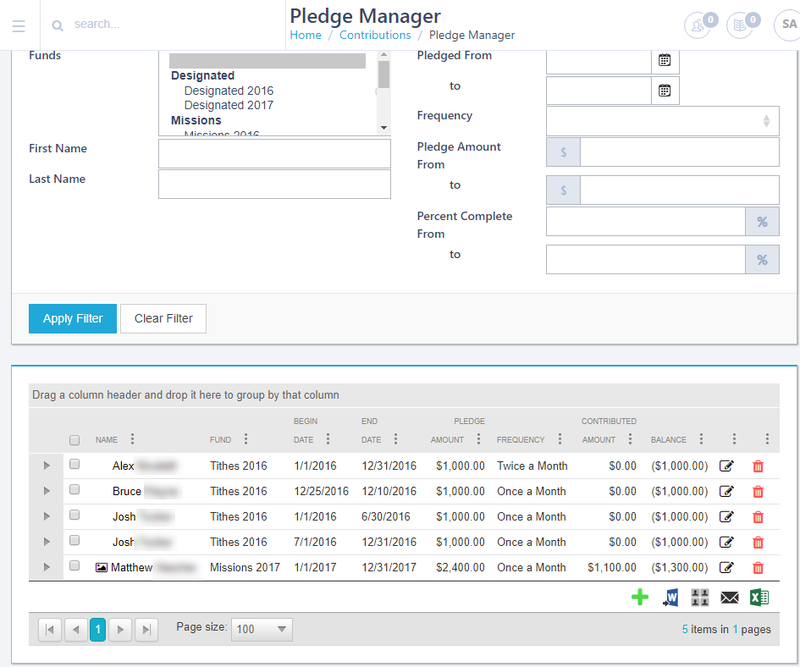 The Pledge Manager page allows you to view previously entered pledges bases on filter parameters. This is an updated version of the Pledges page. The filters allow you to search by Fund, Pledge Amount (Minimum and Maximum), and Percent Complete (Minimum and Maximum). Pledges listed on this page are based on the date range of the individual pledge and the date range of the fund. •Click the Expand icon to view information about a pledge. •Click the Edit icon to make changes to a pledge. •Click the Delete icon to remove a pledge. •Click the Add icon to create a new pledge. When viewing information about the pledge, there are two additional tabs to view the Gifts and the History. The Gifts tab displays the detail giving for this fund. The History tab displays the creation of a new pledge, the information that is changed on a pledge, and the user that changed this information.